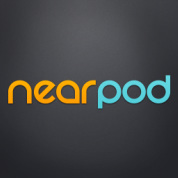 Nearpod - All about apps in YOUR classroom! Nearpod allows teachers to construct presentations using the Nearpod website and deliver instruction to students by pushing content out to multiple devices at once. The teacher controls the presentation from a master iOS device, while students follow along on a class set of iPods or iPads. To enliven instruction, teachers can also embed multiple choice questions, polls, videos, quizzes, open-ended questions, and web-links in their presentations. One of my favorite components of Nearpod is that it has a drawing feature students can use to annotate images. For example, a Social Studies teacher could include a map and have students annotate the route of Lewis and Clark. This same feature can also be used to create graphic organizers or solve math problems. All student responses within Nearpod are submitted to the controlling iPad (held by the teacher) and may be pushed out or shared with the class during instruction. This aspect of Nearpod's design provides a wonderful opportunity for evaluative conversation and collaboration with just the tap of a button. Teachers may easily upload existing Powerpoint or Keynote presentations on the Nearpod website. Nearpod can be a helpful student-centered BYOD tool. Students may access a Nearpod presentation from any network using a browser and a five letter code. Students who are absent may also follow your presentation from home or wherever an Internet connection is available. Download the free teacher and student apps. There is no teacher set-up of student usernames or passwords. When you launch a Nearpod presentation in the classroom, it generates a five letter code that allows students to log into their app or view the presentation on a browser. Upgrade your accounts if desired. There are a two additional upgrades that allow for more storage and a few more features. The Silver upgrade costs 10 dollars a month and a Gold upgrade offers school wide features. The free account though has more than enough features to allow you to see if Nearpod is for you. For more information, you may wish to check out Nearpod's official video: http://vimeo.com/39006989 Please feel free to email mcloutier@psusd.us if you have any questions regarding set up or integration.